When I heard about the new Toy Story Land in Disney’s Hollywood Studios at Walt Disney World Resort (opening on June 30th! ), I was ready to jump in the car right away and take my family to Orlando. My daughter is familiar with the Toy Story characters, but she hadn’t had the chance to become as obsessed as I am. The remedy? A Toy Story movie night. Serve galactic popcorn. Drizzle chocolate in different colors over the popcorn and sprinkle with different shapes (google-eye sprinkles for the Aliens, and red sprinkles and gold stars for a “Sheriff Woody” version). 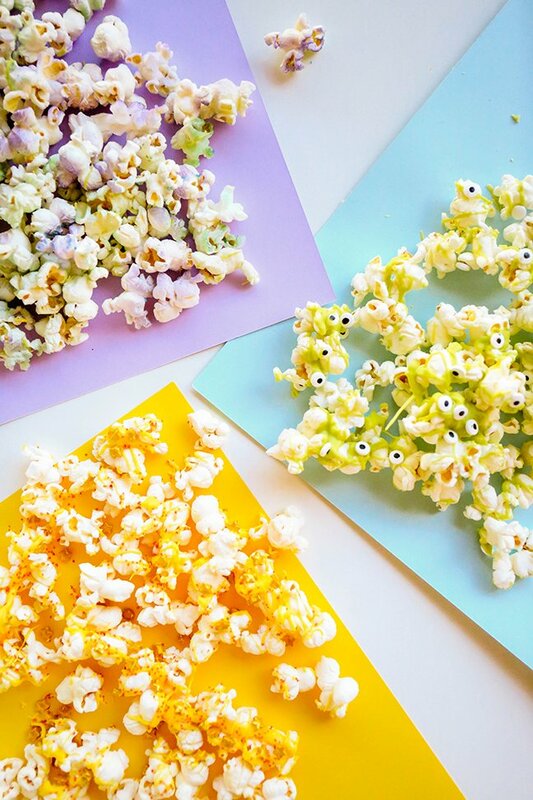 You can also tint the popcorn by using Wilton Color Mist in green and purple. 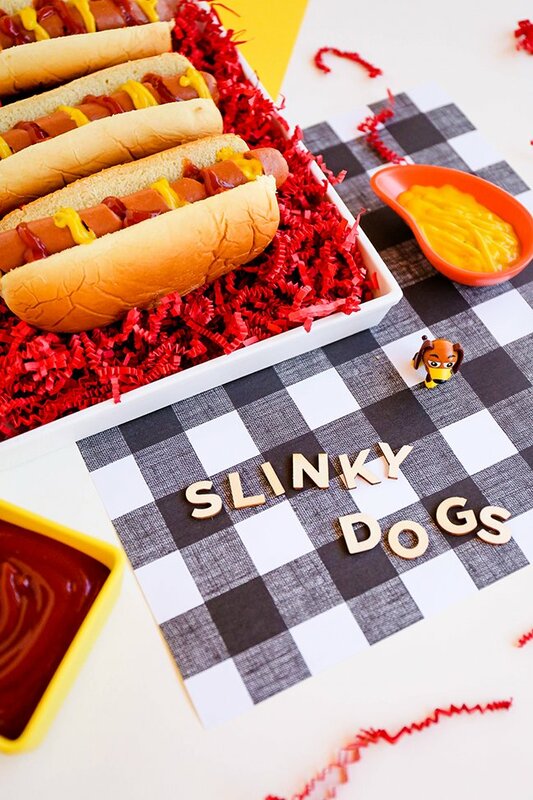 Enjoy Slinky Dogs. In honor of Slinky Dog (who’s getting his very own rollercoaster, the Slinky Dog Dash), simply cut the hot dogs in spirals prior to heating up. Add ketchup, mustard, and any other toppings you might like when devouring this movie-night favorite. 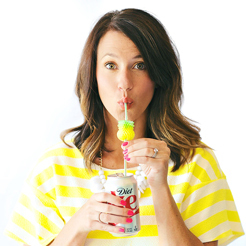 Pass around these licorice lassos. 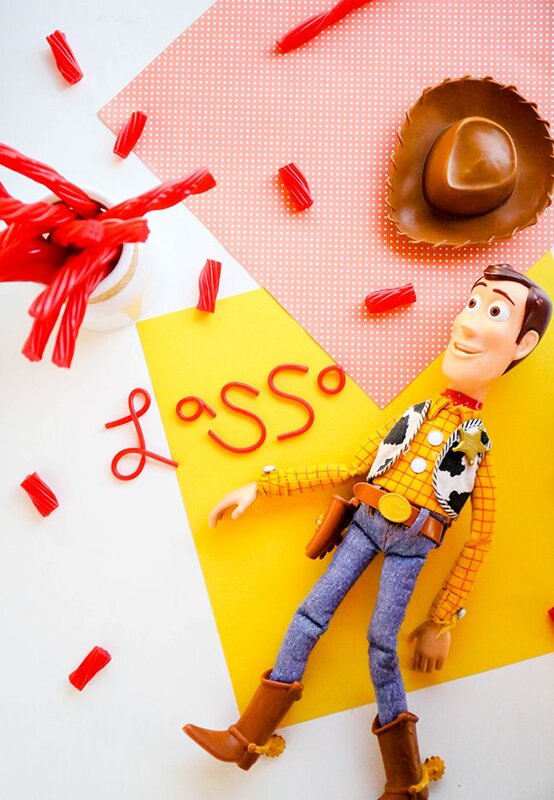 I never watch a movie without munching on some licorice, and Twizzlers Pull-n-Peel can easily be transformed into lassos for you and your little deputies to enjoy. 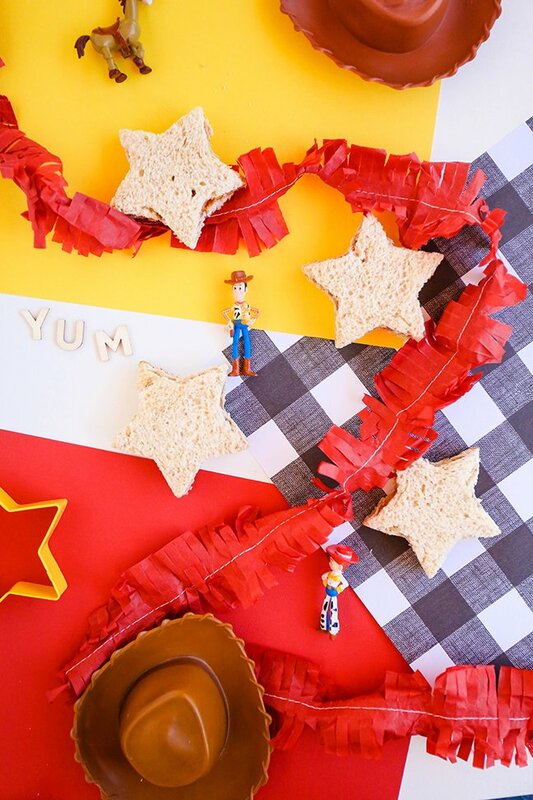 Make some “sheriff sandwiches.” As any cowboy knows, PB&J sandwiches are extra delicious when cut into star shapes. 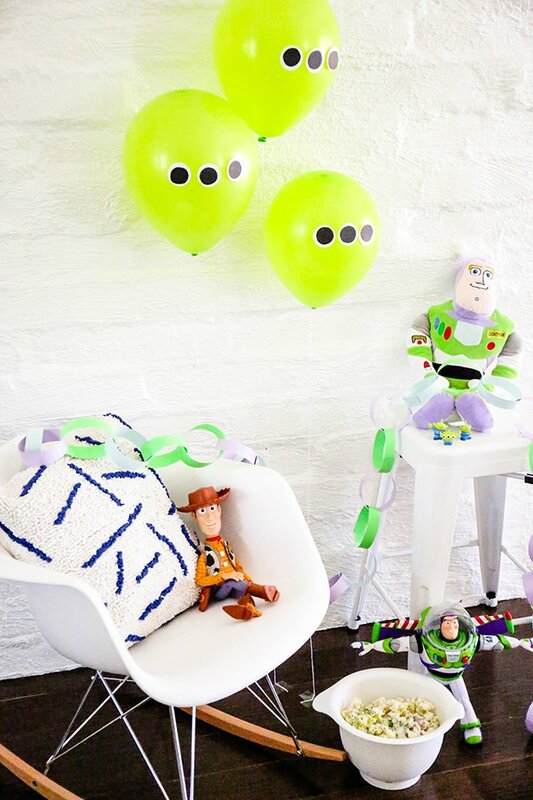 Make out-of-this-world décor. 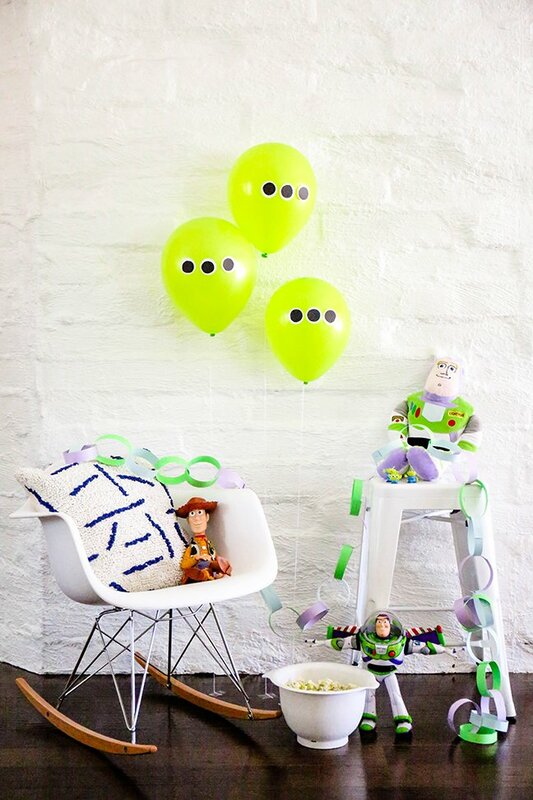 Create balloons reminiscent of those cute little Aliens by adding three eyes to green balloons. Cut out white paper circles and tape smaller black circles inside of them to create the eyes. Then affix them in a row to each balloon. Freeze cosmic ice cubes. Use a specialty ice cube tray (like this one) to freeze rockets, space guns, aliens, and astronaut helmets. 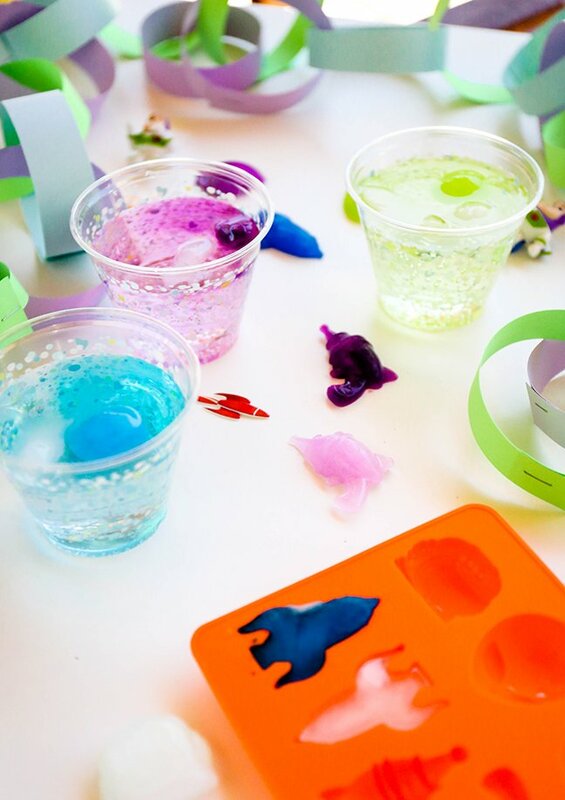 We added a drop of food coloring to the water before freezing, which tinted our drinks to some of the prettiest colors in the universe. 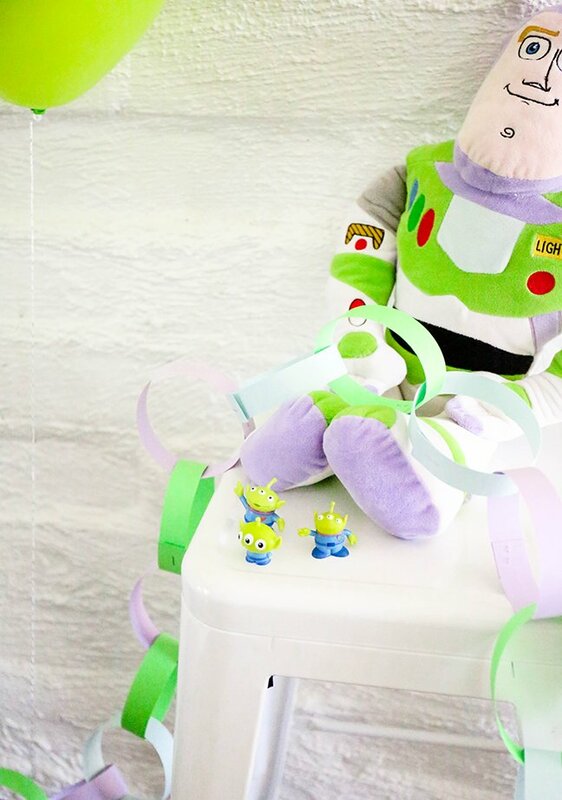 Hang an interstellar paper chain! Bring back that grade-school craft, and make a paper chain in blue, purple, and green. It looks super-stellar anywhere you hang it! Munch on outer-space Oreos. The classic cookie gets an intergalactic makeover when dipped in green chocolate. 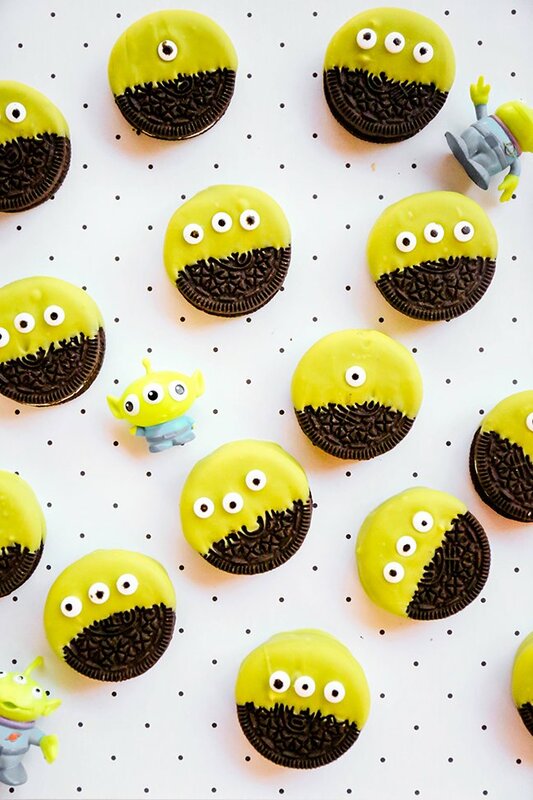 Attach eyeball sprinkles to match those cute little aliens found at Pizza Planet. These will get the whole family excited to ride the Alien Swirling Saucers at Toy Story Land. OooOOooo! Pack favors in cow-print muslin bags. 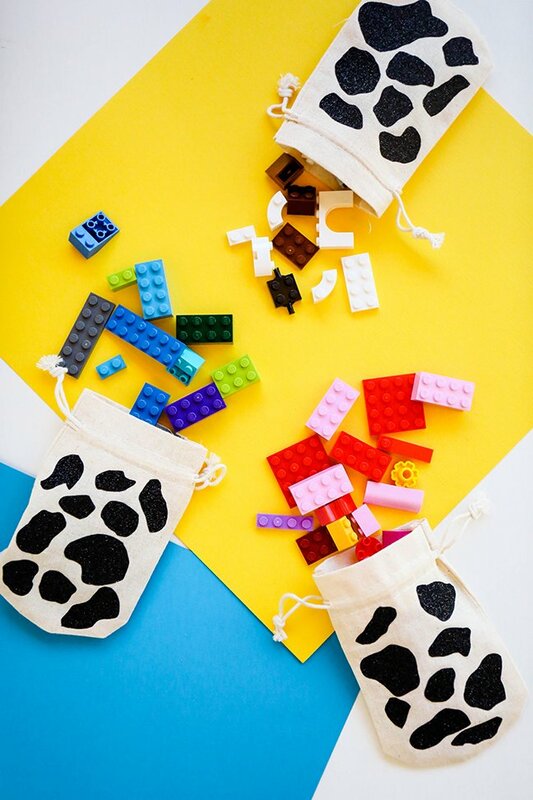 These mini bags match Woody’s and Jessie’s cow print vests! Cut out random shapes in black glitter iron-on material and attach them to the bags using an iron. (Make sure an adult helps with this one to avoid any burns!) Fill the bags with things you might find in Andy’s toy box, like some blocks, army men, or even some candy.